We The People are in big trouble. Our planet is under attack. Global industrialists blame us for pollution and over-population, and they aim to kill more than 6 billion people over the next few decades, neglecting solutions to the pollution and problems they cause for profit. Enter Dr. Leonard G. Horowitz, an award-winning author, filmmaker, and recipient of the “World Leading Intellectual Award” from officials of the World Organization for Natural Medicine, who advances a proposed solution through widespread education and grassroots activism. Dr. Horowitz explains in a new segment on Vimeo (and YouTube), that both pollution by hydrocarbons, such as CO2, and “global warming” from rising solar radiation linked to ozone depletion, results fundamentally from acidification of the atmosphere and planet. He theorizes the acidification of the planet is the primary cause of increased “solar flares” and solar radiation, NOT COSMIC FORCES BEYOND HUMANITY’S CONTROL. Dr. Horowitz and the “528Revolution” (which I encourage everyone to join) advances a “wholistic” treatment for global warming featuring alkylinizing methods and materials to bring more electrons from water (H2O) to balance the energy and return integrity to our atmosphere and our bodies. This is “fundamental to good health,” Dr. Horowitz says; and he should know having written more than a dozen consumer health books. Dr. Horowitz obviously encourages a most urgent transition to “free energy,” non-polluting sources of sustenance, such as those secreted and stolen from Nikola Tesla. 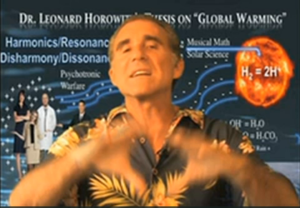 The 528Revolution, and Dr. Horowitz’s “Natural Cure for Global Warming,” advances knowledge about the frequency resonance of sunshine, that generates more atmospheric electrons from hydrogen, the more polluted and acidified Earth’s atmosphere becomes. WATCH HIS PRESENTATION NOW TO LEARN MORE NOW by. CLICKING HERE. About the Author: Sherri Kane is an investigative journalist who wrote the forward to Dr. Horowitz’s Book of 528: Prosperity Key of LOVE, and has partnered with him in the develop of 528Records.com and 528Radio.com.